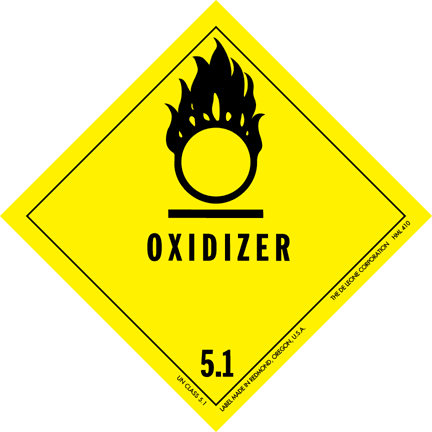 Oxidizing agent can have two meanings. It can be a chemical that releases oxygen atoms. For example, potassium chlorate has a chemical formula of KClO3. When it oxidizes a reducing agent, such as powdered aluminum metal, it loses its oxygen to the aluminum and becomes potassium chloride, KCl. Another definition is a chemical that accepts electrons from a reducing agent. For example, potassium permanganate has an oxidation state of +7. In acid solution, it gains 5 electrons (e-), becoming a manganese compound with an oxidation state of +2. Most oxidizing agents of the second (electron-accepting) definition have oxygen, but not all. For example, fluorine (F2), the most powerful oxidizing agent, does not have any oxygen in it. When it acts as an oxidizing agent, it gains an electron to transfer from an oxidation state of 0 to an oxidation state of -1. Oxidizing agent Facts for Kids. Kiddle Encyclopedia.